I wish for a good day. He used to kneel by his bed, his teddy bear, Chester, next to him, forming his chubby little hands into a prayer, his face all earnest and hopeful. I thought it was cute but I always wondered where he got it from because I wasn’t one for kneeling down and praying or even for inviting in the goodness of the day. Now I know that’s what he was doing. Somehow he had figured out that by wishing for a good day he was opening himself up to the possibilities the day could bring. So what constitutes a good day? Everyone you meet being nice to you? Getting everything on your TO DO list done? The answer lies with my son back when he was still wishing that the day brought him good things. I used to ask him: What makes a good day? Being able to watch TV until noon in my pajamas. A new batch of playdough. A bird looking at me through the window. Seeing a cloud shaped like a heart. Making a crying baby laugh. The good things occasionally seemed like poetry. Almost as if the good things – unnamed and somewhat mysterious – were wishes themselves. Wishes come true. Here are some things that make a good day that could be like someone’s wishes that are about to come true….. 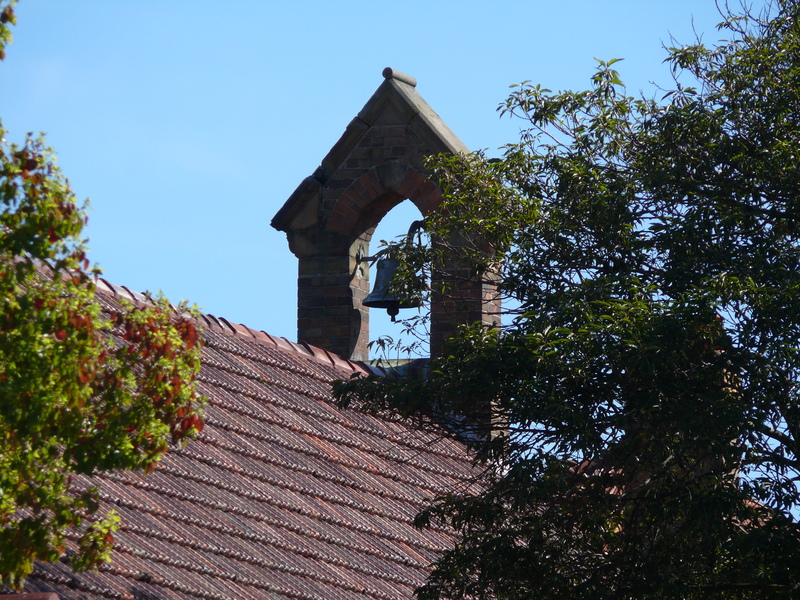 Seeing the bell on the local church for the first time, stolid and reassuring like an echo from the Middle Ages. 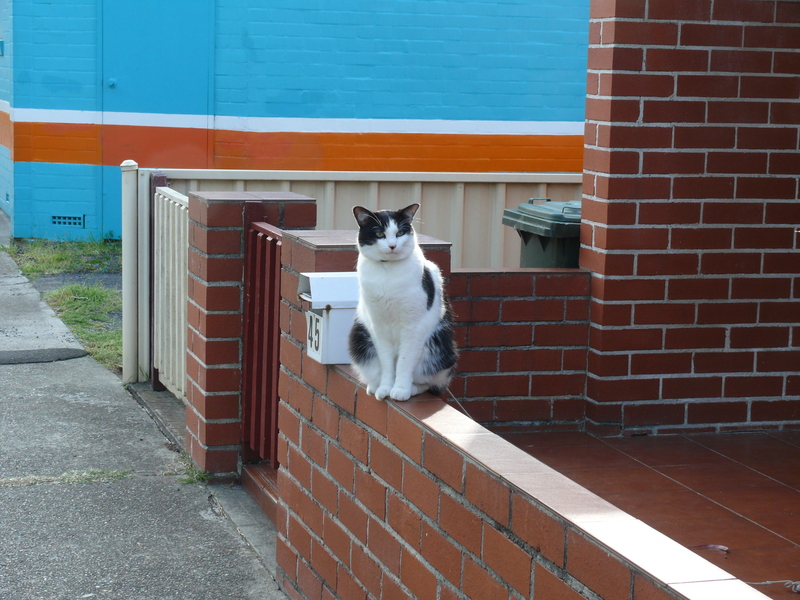 The local cat in his usual place on the wall. Seeing it all. Knowing it all. Always watching. The ice cream van with its familiar strain of Greensleeves and lurching clutch. Seeing kids still be kids and run after it clutching two dollar coins; hoping for choc tops and a soft serve vanilla with sprinkles. 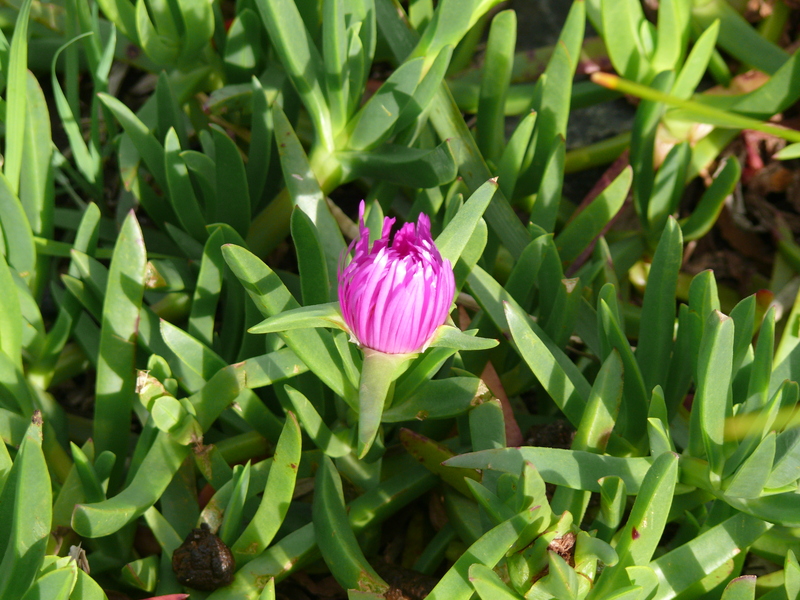 A single flower by the roadside, bursting out through the overgrown shrubbery. A radiant, breathtaking magenta. And then walking along, thinking: No one believes in magic anymore. People are all so caught up in electronic gadgetry that they don’t imagine things, don’t tap into stories and dreams. And then I see this guy looking out at me from the park wall. Throwing the enduring power of words out into the world. The power of storytelling, turning up in unexpected places like someone’s wish come true. And I know the good things in the day, the magic in the day, the little creative sparks, the wishes – are all around us. We just have to see them. Sometimes the wish is all about noticing what is already there. How true. We become jaded, caught up in the hustle bustle of every day life, no longer be able to see the world through a child’s eye, with a child’s imagination. I’m thankful for one gadget and that’s the ‘net. It’s opened up the world for me to be able to read the works of people I would otherwise never have the chance to enjoy. That’s a kind of magic in itself for both readers and writers alike. I think we all need to remind ourselves to indeed stop and smell the roses as they say, to take the time to “see.” Life should be more than the mundane. The best way I’ve heard it said is in an old internet joke about dying, skidding into death at the last possible moment, windblown and disarrayed, a bottle of wine in one hand, a box of chocolates in the other, screaaming WHEEEEEE!! WHAT A RIDE! THAT’S how life should be! Amazing what makes a day wonderful eh? Little things… like boys praying for a bird in the window. You and I are so alike. I completely agree with you. The net really is something I value because it has openmed up another world for me. I love the friendships it has given me and how it has opened up the world for me. I really couldn’t get by without it. And life – the most joyful of rides – that is so what it should be like. YEEEHAAA!! It’s so cute, isn’t it? It still makes me smile after all these years. You are so right. People are so busy rushing here and there that they miss the little things that enrich us. Don’t get me wrong, I do it too. But sometimes it is nice to stop and really see things. I am sure it moves when no one is looking. Isn’t it cool? I love Alan Rickman! so true. the photographs are wonderful, as are the words. i notice the turquoise wall behind the cat. the tea-pink color of the ice cream truck, the back wheel hubcap matching. there’s a tiny little heart on the wall next to alan rickman. and it all seems magical somehow. I agree with tipota – I particularly like the blue behind the cat (like the sea) and the icecream van (haven’t seen one like that for ages). There is magic all around us and only some take the time to see it. The image of your son wishing for a good day is so gorgeous. 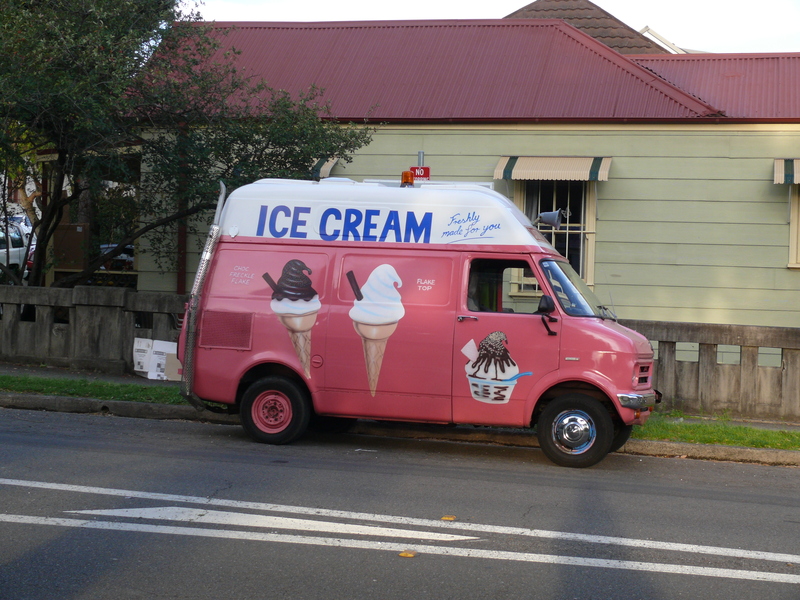 Oh, the ice cream van brought back memories! And, when he got chimes in the late 50s, naturally, they played ‘O Sole Mio’ … coincidentally, half a century later and 200 miles away, that’s the very same tune the van that visits our street plays! Very nice. With everyones busy lifestyles these days we seem to miss the things that are around us, more people need to stop and “smell the roses”. Nothing to add – you expressed this wonderfully. Ah yes, the little things like ice cream can make for a good day indeed ! “Sometimes the wish is all about noticing what is already there.” Perfect ending to this endearing and wise post. Today, I was wishing or listening to my stomach grumble while doing some errands. This wasn’t any profound wish, just ordinary- gee, I’m hungry, but no time nor $ to buy lunch out. Well, I passed a storefront and it caught my eye because there were groceries in it. Or so I thought. As I stepped in, the cozy scent of alluring fresh baked bread enveloped me in one giant hug.It was no grocery store, but a small bakery instead! They offer a free slice of fresh baked bread daily, but I’d never known that for the 6 years they’ve been there. (I live so close but never explored that area.) Well, I indulged in yummy cinnamon fresh baked bread. Ahhhhhh! The bonus was how much the woman enjoyed talking about this bread. Her smiles are still with me. Thanks for the uplifting post and wonderful pics, Selma. “Any day above ground is a good one” – Don Williams, Jr. I love this post. Tomorrow, I shall wish for a good day. Good topic Selma. The ice cream truck is still trying to make a buck here–despite the cooling temps and the good bye of summer. I like the idea of starting a day with a thought about making it a good one. It is an easy thing to overlook as I wake in a rush to go from task to task. Just stopping in to say hello, send a hug and wish you well. Hope everything is ok. This was lovely. It’s good to be reminded that the good things in life are right there for us, we just need to see them for that and realize they are exactly what we need and want, even if they don’t look like it at first. “all about noticing what is already there”. I know has been said many times before, but it gets my vote. Glass half full is the way to be… by the way, to travelrat, we had zacs too, but our treys were ‘thrippences’! SORRY ABOUT THE LATE REPLIES, EVERYONE. I AM VERY DISORGANISED…. That’s so cool about the colours. I hadn’t really noticed how they all went together, but they do. I wonder if I chose them all subconsciously. That is brilliant. I love the ice-cream van with its jingling, off key version of Greensleeves. I imagine a very old monkey winding the handle on the organ, bloated from too much ice cream and chocolate sauce, wondering when he can retire. It makes me smile every time I see it! I remember the ones that played O Sole Mio when I lived in Glasgow. I used to like the vanilla cones with raspberry topping. Those werre the days! I love smelling the roses. It is so important. There are so many gorgeous things out there. I don’t want to miss any of them! 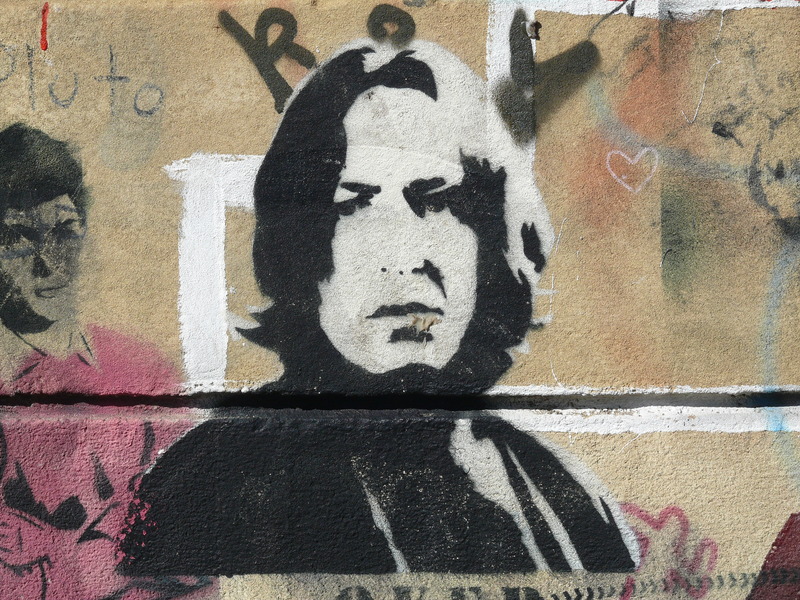 I couldn’t believe Alan Rickman was there on the park wall. The power of Snape is far-reaching!! Ice-cream makes everything better. Except soy ice-cream. I can drink soy milk but soy ice-cream is just gross. Blech. You are a sweetie. Thank you so much! What a magical moment. I can smell the divine scent of the cinnamon right now. I really love moments like that. They make life worth living. You are very welcome. And it is great to hear from you. I miss you. Hope you are well. I hope your wish comes true. Every single day!! I think wishing for a good day is quite a nice philosophy to follow. Maybe it lets all the good vibes in. I hope so! I am better now. But last week? Good Lord!!! It’s true, isn’t it? When you think about it the small things shape our memories much more than the big ones. They are quite significant in their own way. I love noticing them! YAY for the chapters. YAY for the chapters. I think Snape said it in one of the early books. Trust me for not writing it down. I’ll find it and let you know. It is spring here. There are flowers everywhere. It is so gorgeous. It is always a pleasure to visit you. I do enjoy it. Glass half full is always the way to go. No matter what!